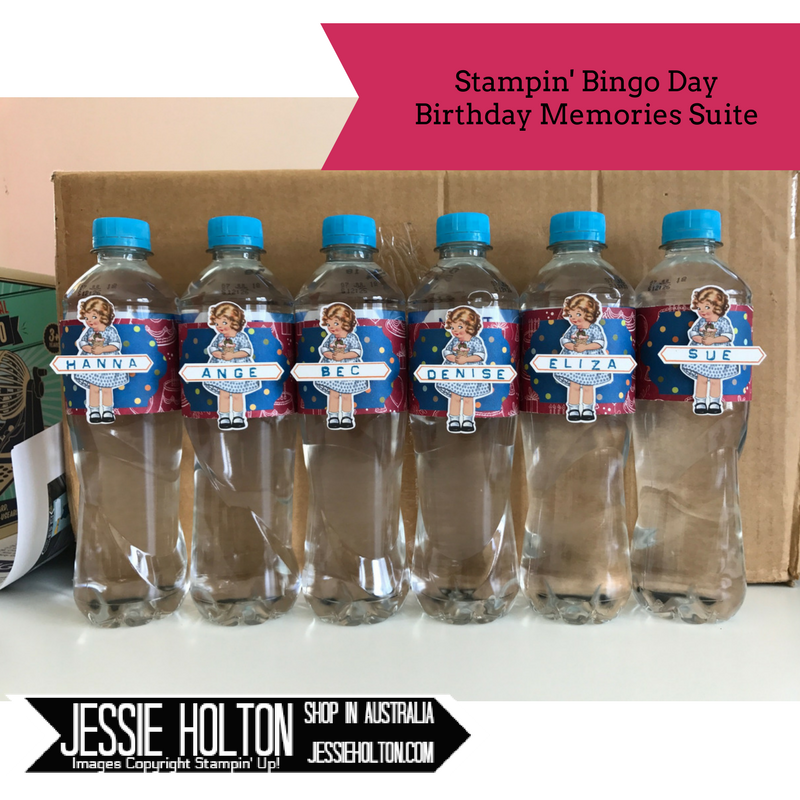 I'm so happy to announce that my first Stampin' Bingo Day was a success & I will be planning another one in November - Christmas Theme! So if you're in the area, make sure you come along for the fun! All the following include Birthday Memories Designer Series Paper (DSP), Birthday Delivery stamps & Birthday Friends Framelits. This is the gift pack each attendee received. There's a full pack of the DSP & the coordinating mixed A4 card stock pack, full colour instructions, grid paper, Whisper White envelopes & inner panels, a thank you card from me (Blushing Bride Little Girl - more pics of her to come in a later blog post), a dolled up bottle of water & a little treat bag with the cake design DSP & two Ferrero Rochers. They also each received a full roll of the Stitched Edge Ribbon (not pictured) in their preferred colour. Here is a close up of all the bottles of water. I used the Labeler Alphabet stamps to create name tags. These doubled as place tags & so the girls didn't get their drinks mixed up. 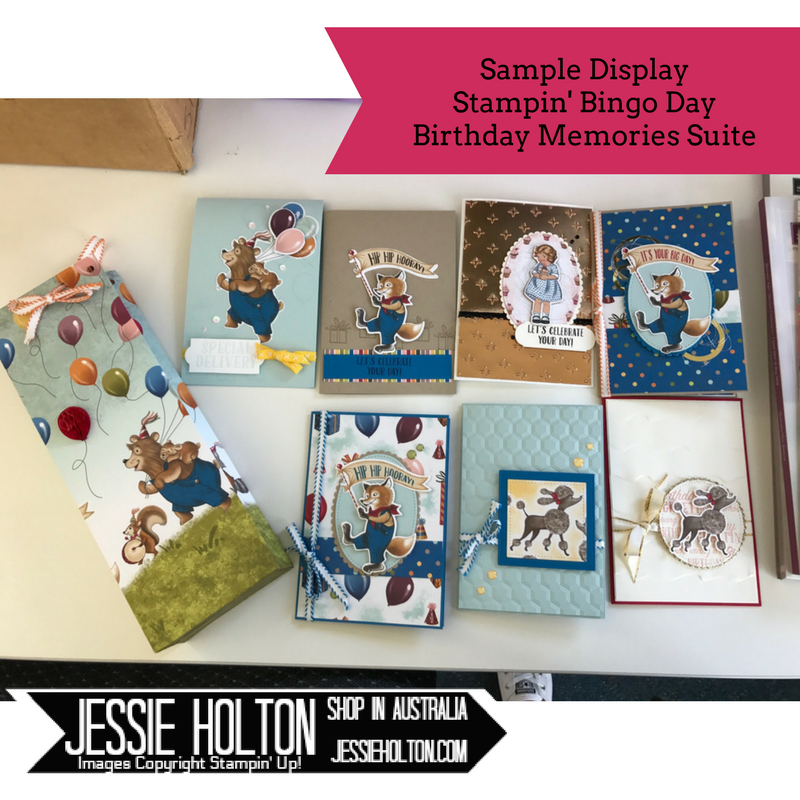 The name banner is stamped with Pumpkin Pie & Pacific Point using the Labeler Alphabet & Thoughtful Banners stamp sets & cut with the Classic Label Punch. 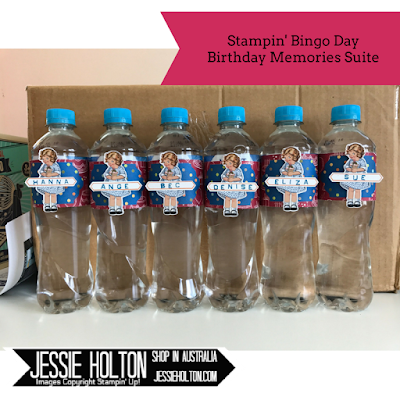 I have used the Birthday Friends framelits to die cut the Little Girl from the DSP, Pacific Point dot DSP from the Lots of Labels dies & the Real Red DSP is cut in 5cm strips & taped closed at the back of the bottle. 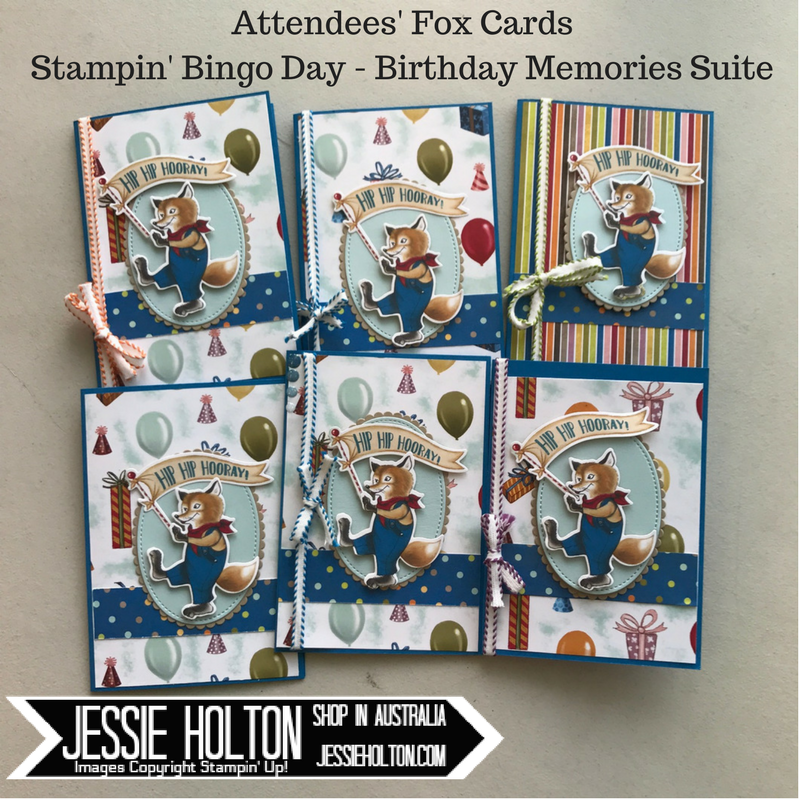 These are the Fox cards the girls made. 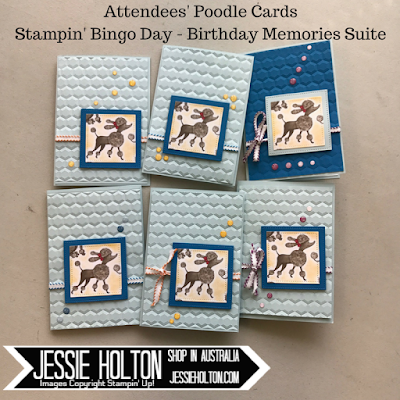 The oval layers have been die cut with the Layering Oval dies & the Stitched Shapes dies. 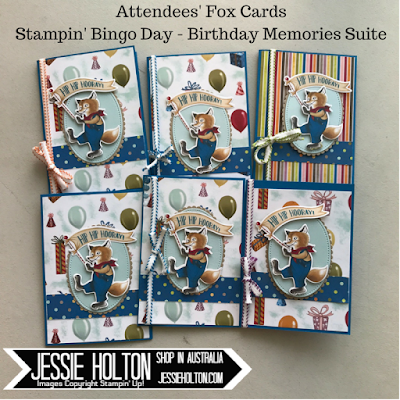 The fox & banner were die cut with the Birthday Friends dies. The foxes are propped up on Dimensionals. You can also see the different colour ribbons in this shot - Pumpkin Pie, Pacific Point, Old Olive & Rich Razzleberry. 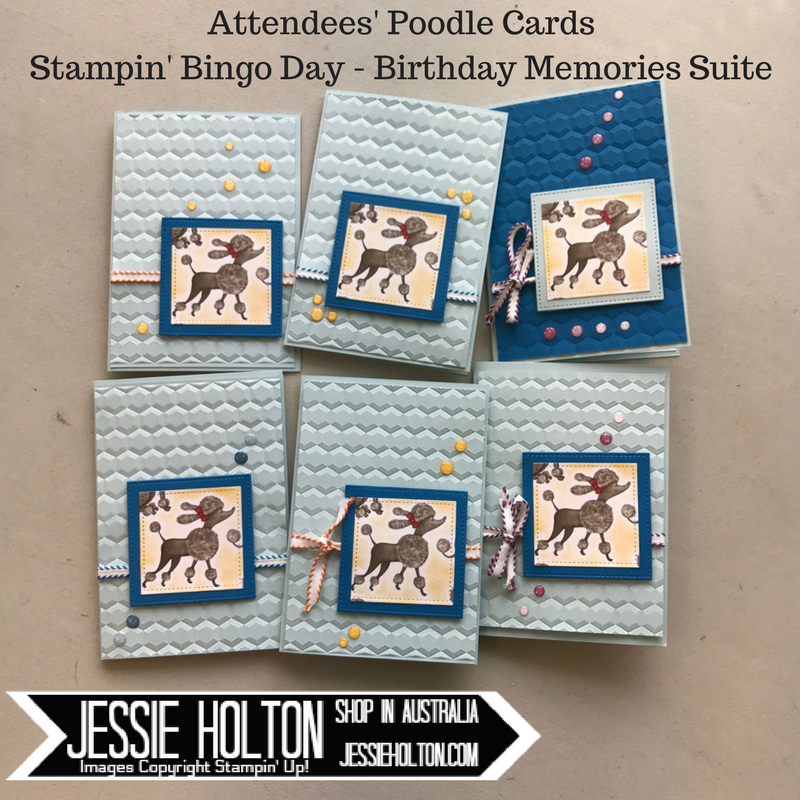 These are the Poodle cards made by the attendees. 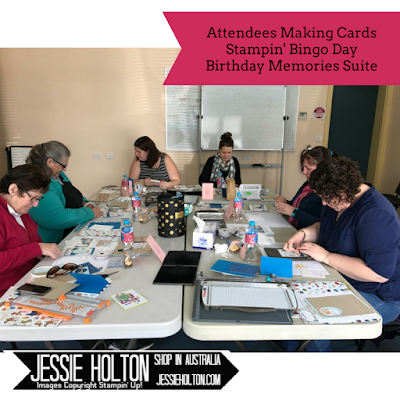 They have used the Hexagon Embossing Folder, Stitched Shapes Dies & Glitter Enamel Dots. The Poodles are also up on Dimensionals. I had a bunch of embellishments, Dimensionals & ribbons in the middle of the table for the girls to use. 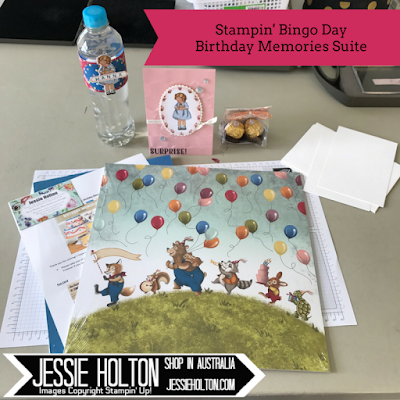 So we did play some games of Bingo during the day as well. These are the prizes the girls could choose from. 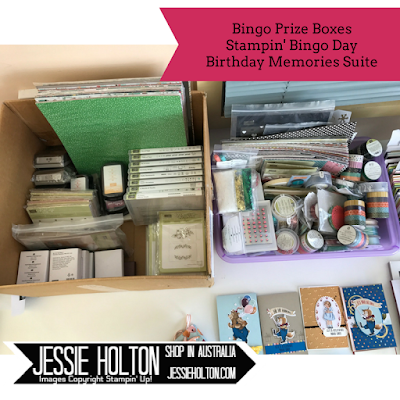 There were major prizes in the brown box (1st game) & smaller prizes in the purple box (2nd game). 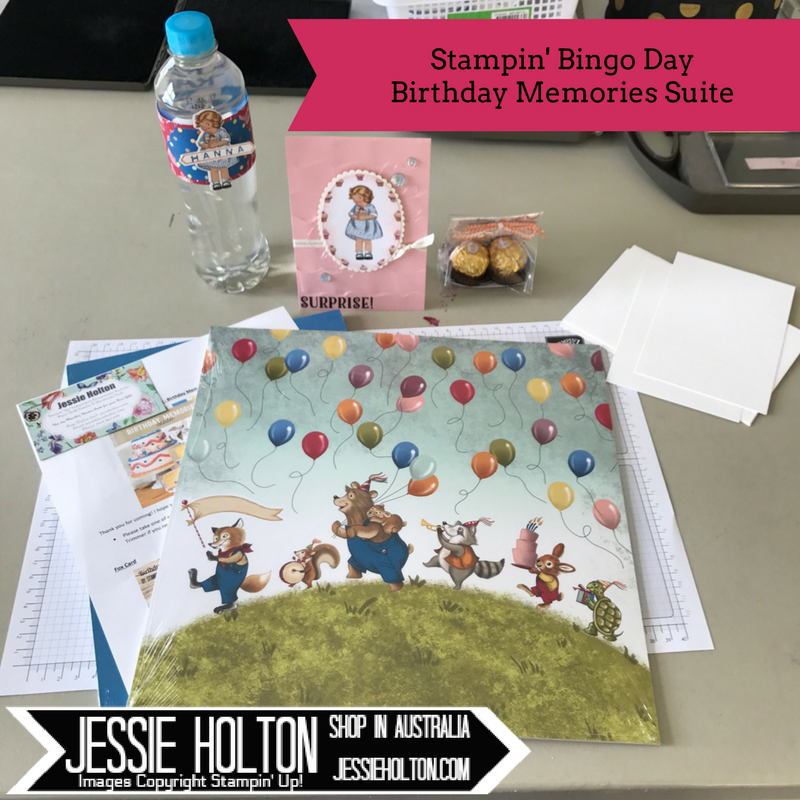 We had two games of bingo, made the fox card, two games of bingo, made the poodle card, two final games of bingo. So three major prizes & three smaller prizes in total. Each attendee received a bingo card for the day but some of the girls bought additional bingo cards.